Remarkable good news and some bad, in the fight against HIV, has been dispatched from the battle front last week. UNAIDS, the United Nations organization charged with combating HIV/AIDS, issued the latest progress report on progress towards the achievement 90-90-90 goals. Launched in 2014 at the 20th International AIDS Conference in Melbourne, ’UNAIDS 90-90-90 targets’ became a central pillar of the global quest to end the AIDS epidemic. Let’s return briefly to the Past. On World AIDS Day 2014, mayors from around the world came together in Paris, France, to sign a declaration to end the AIDS epidemic in their cities. In signing the 2014 Paris Declaration, the mayors committed to putting cities on the Fast-Track to end the AIDS epidemic. Those commitments, known as the ’UNAIDS 90-90-90 targets’, are aimed to result in 90% of people living with HIV knowing their HIV status, 90% of people who know their HIV-positive status on antiretroviral treatment and 90% of people on treatment with suppressed viral loads, keeping them healthy and reducing the risk of HIV transmission. On the positive side of the UNAIDS 2017 report, substantial progress has been made towards the 90-90-90 targets. More than two-thirds of all people living with HIV globally knew their HIV statuses in 2016. 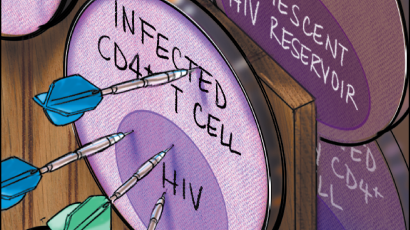 Among those who knew their HIV status, 77 percent were accessing antiretroviral therapy, and 82 percent of people on treatment had suppressed viral loads. Amid this progress, a significant milestone has been reached in 2016: “A record 19.5 million people are accessing antiretroviral therapy, and for the first time, more than half of all people living with HIV are on treatment,” says Michael Sidibé. The death rate from AIDS also continues to fall. In 2016 there were one million AIDS-related fatalities, down from 1.9M in 2005, the year of peak mortality. So the distribution of antiretroviral drugs in almost all parts of the world to those already HIV-positive was beneficial. Such drugs can prolong life spans nearly equal to those uninfected while keeping symptoms suppressed indefinitely long. The rate of new infections, though dropping, is not doing so as fast as UNAIDS and its allies had hoped. In 2016 1.8M people became HIV-positive. That is down from a peak of 3.2M in 1997 but has declined by only 16 percent since 2010. On present trends, the official UNAIDS target of reducing the rate of new infections to 0.5M a year by 2020 looks hopelessly optimistic. Also, according to the HIV drug resistance report 2017, presented by WHO in Geneva on July, 20, over 10 percent of people starting antiretroviral therapy have a strain of HIV that is resistant to some of the most broadly used HIV medicines. The study was held the eleven countries in Africa, Asia, and Latin America, in six of this countries researchers have found high drug resistance incidence. WHO recommends to urgently review HIV treatment program in any country where the ten percent threshold of the HIV drugs resistance has been reached. In Eastern Europe and Central Asia, the number of new infections has risen by 60 percent, to 190 thousand in 2016. Report on the continuum of HIV care has been released in April by the European Centre for Disease Prevention and Control (ECDC). According to this document, only three of 37 countries have achieved the first of the UNAIDS targets with 90 percent of all PLHIV knowing their status: Romania, Denmark, and Sweden. 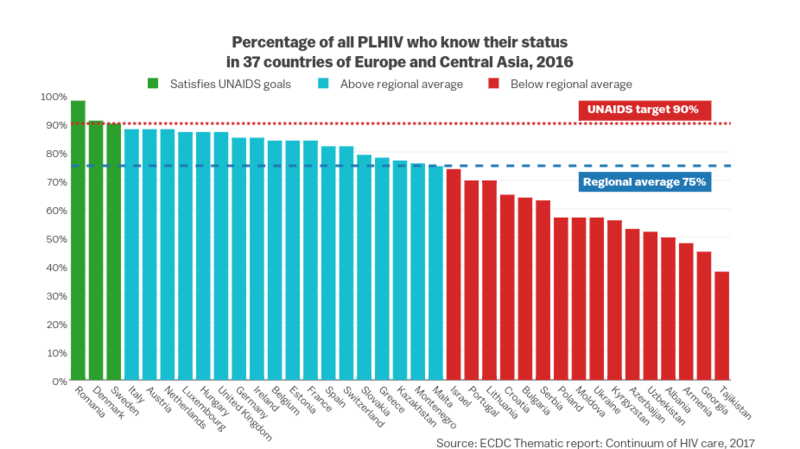 18 of the other 34 countries reports that over 75 percent of PLHIV are aware of their HIV status and 16 countries say that fewer than 75 percent of PLHIV know their status. Eight of the 40 countries have achieved the second of the UNAIDS targets: 90 percent of PLHIV know their status and are on treatment. These countries are Denmark, Ireland, Malta, Slovenia, Spain, Sweden, Switzerland and the United Kingdom. Of the other 32 states, eight reports that more than 77 percent of PLHIV who know their status are on treatment, and 24 reports that fewer than 77 percent of PLHIV who know their status are on treatment. In nine of these countries, less than 50 percent of PLHIV who know their status are on treatment. 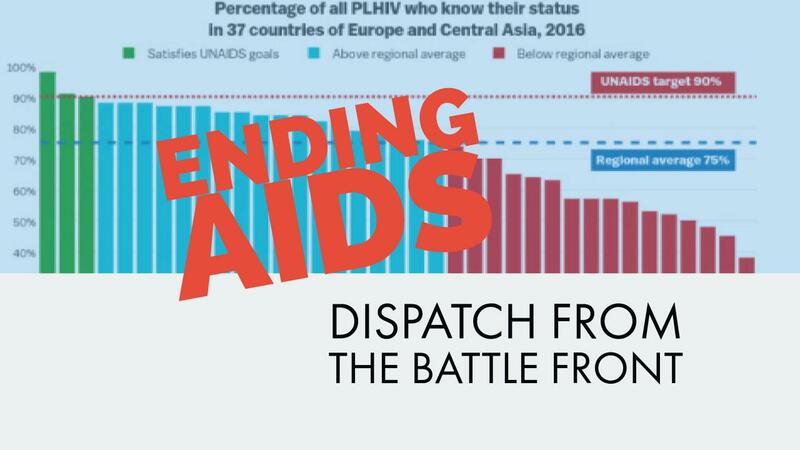 Eleven of the 31 countries (Belgium, Denmark, France, Germany, Hungary, Luxembourg, Netherlands, Serbia, Sweden, Switzerland and the United Kingdom) have achieved the third of the UNAIDS targets: 90 percent of PLHIV who are on treatment are virally suppressed. The other 20 countries report that between 32% and 88% of PLHIV on treatment are virally suppressed. In nine of these countries, fewer than 70% of PLHIV who are on treatment are virally suppressed. The region’s HIV epidemic is principally within two countries: Russia and Ukraine, where are enormous gaps across the 90-90-90 continuum. HIV testing rate and treatment coverage are low. Key populations in these regions are unable to access services and linkage to care is weak. “These countries are unlikely to meet the 90-90-90 target,” concludes UNAIDS 2017 report. A high hope for implementing such promise gives generous community support for global health programs for ending AIDS like recent charity activity of public—private partnership between the Elena Pinchuk ANTIAIDS Foundation and the city of Kyiv resulted in enabling 1.3 thousand people living with HIV in Kyiv to access antiretroviral therapy. “For people living with HIV, these pills symbolized their future, happy families, healthy children and life opportunities. We welcome this initiative as one of the most essential and meaningful outcomes of the Fast-Track cities initiative in Kyiv,” notices Dmytro Sherembey, Head of the All-Ukrainian Network of People Living with HIV. Central Asia is one of the few regions in the world where the HIV epidemic is still on the rise. The number of people living with HIV increased from one million in 2010 to 1.5 million in 2015, and only 21 percent of all people living with HIV were accessed antiretroviral therapy in 2015. However, more than 95 percent of pregnant women living with HIV received treatment to prevent mother-to-child transmission of HIV. 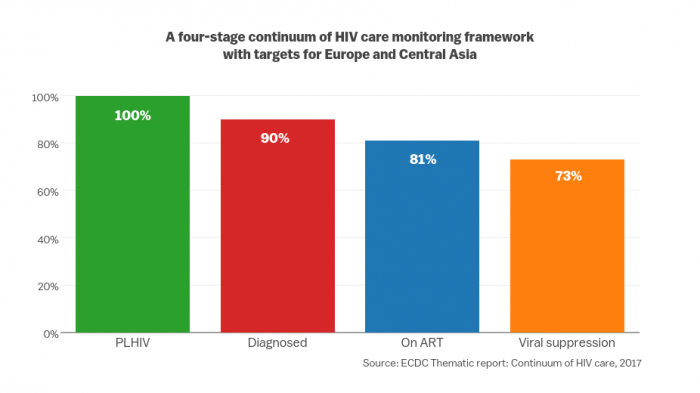 In Central Asia, progress towards achieving the UNAIDS 90-90-90 goals is controversial and varies considerably in different states. Kazakhstan is a positive example. 90 percent of the funding for the AIDS response in Kazakhstan comes from national resources, and UNAIDS calling on other CIS countries to follow Kazakhstan’s example. “Kazakhstan is on track to be the first country in Central Asia to achieve global treatment targets by 2020, a major step towards ending the AIDS epidemic by 2030,” stated Vinay P. Saldanha, Director of the UNAIDS Regional Support Team for Eastern Europe and Central Asia during his official visit to the country. Kazakhstan supported the statements of 2016 by practical efforts. On July 20-21, right in the days the grand IAS Conference held in Paris, Almaty City government officials signed the Paris Declaration, calling for ending the HIV/AIDS epidemic in Kazakhstan. The event, was a part of the project of the Public Health Alliance “accelerated response to HIV/TB epidemics among key groups in the cities of Eastern Europe and Central Asia.” The ceremony was also honored with a visit of Mark Moody, Consul General of the United States in Almaty, UNAIDS and “East-West AIDS Foundation in Kazakhstan” officials. These days researchers and public health leaders from all over the world are discussing prospective actions towards ending HIV/AIDS at the 9th IAS Conference on HIV Science (IAS 2017). The agenda is that today the idea of a cure for AIDS, namely a medication that will eradicate the virus from someone’s body completely, remains a distant prospect. 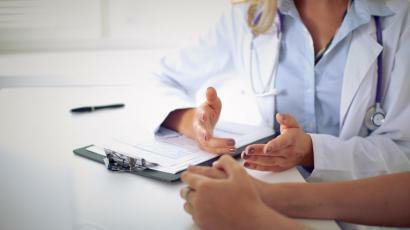 Long-acting, slow-release antiretroviral medicines offer the promise of improved patient adherence to a drug intake, and progress with cancer immunotherapy has granted new lines of the demand. Among the forum scientific highlights was an opening keynote by Monsef Benkirane of the Institute of Human Genetics in Montpellier, France, presenting his team’s recent breakthrough work identifying the CD32a marker, which, for the first time, makes it possible to differentiate “dormant” HIV-infected cells from healthy cells. 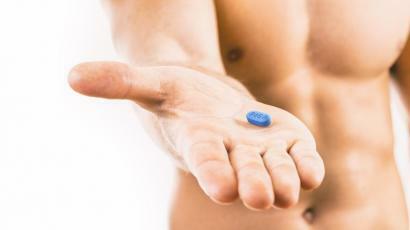 The use of medications for prevention in high-risk groups and microbicides known as PrEP, pre-exposure prophylaxis, will boost prevention efforts. 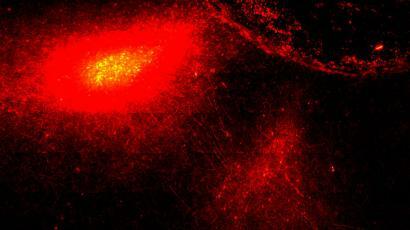 In the longer term, work continues on a potential cure as well as on possible vaccines. Testing is also important, so WHO announced that the first HIV self-test was prequalified in a movement to increase HIV diagnosis and treatment, marking a significant step in allowing countries to implement self-testing as an integral approach to reach those who remain undiagnosed due to fear of stigma and discrimination. The battle for numbers in the reports does not mean anything if people are discriminated, stigmatized, and even harassed. “Data from a variety of sources show that that gaps in the 90-90-90 continuum are greater for men, young people, and key populations. Harmful masculine gender norms contribute to greater risk-taking and poorer uptake of health services among men. Consent laws and insufficient access to comprehensive sexuality education deny young people the services and knowledge they need. Key populations often face criminalization and high levels of stigma and discrimination. Closing gaps in service coverage requires intensified efforts to convince men to reject harmful versions of masculinity, and to reach and empower women and girls, young people and key populations, to enhance their agency and to ensure their human rights are respected and protected. Addressing stigma, discrimination and human rights violations at all levels through the creation of a protective and empowering legal environment and strong rule of law is an imperative for both the AIDS response and the wider 2030 Agenda for Sustainable Development,” claims Michel Sidibé during his Facebook Live discussion with Linda-Gail Bekker, president of the IAS. The efforts of researchers and global organizations would be nothing without motivated young leaders and medical specialists. In Ukraine the Union of Adolescents and Youth “Teenergizer” created by teens for teens towards “a world free from discrimination in all areas, including HIV; a world where the rights of teenagers and youth do not have to be defended because they are fully respected,” became a significant player making progress in the destigmatization of HIV-positive teens as well as raising awareness about HIV/AIDS and methods of prophylaxis. So the hope for ending HIV and AIDS is in the hands of young leaders. Just let them act.